Fret not, jailbreakers, because the recently released Pangu jailbreak (which offers an untethered solution for iOS 7.1.x-powered devices) is already compatible with iOS 7.1.2. As such, it’s quite safe for jailbreakers to update to the new version of Apple’s mobile OS before re-jailbreaking their iPhone, iPad, or iPod touch using the same Pangu method. Cupertino indeed released iOS 7.1.2 to the general public yesterday, bringing improvements to the Mail application and iBeacon to iOS devices. Pangu, on the other hand, launched for Windows-powered computers towards the end of June and made an appearance for Mac computers soon after. While the Pangu method indeed works as advertised, prospective users should be warned that many popular jailbreak tweaks are yet to receive iOS 7.1.x compatibility updates. 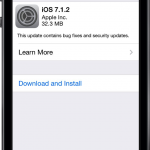 It could be that updating to iOS 7.1.x on your iOS device actually breaks one of your much-loved packages, and so our advice is for jailbreakers to proceed with caution. You can download iOS 7.1.2 over-the-air (OTA) from Apple, and Pangu is available free of charge from its own website, en.pangu.io. See also: Apple Said To Have Fomed Own Speech Recognition Team To Enhance Siri, Square Enix And Gree To Release Final Fantasy Artniks Dive In Japan This Summer, and Pebble Smart Watch Updates Bring Double-Click Notification Skipping And More Tweaks.